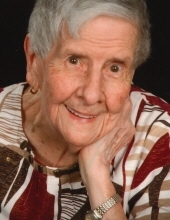 Mary Louise Brown passed away on Thursday, November 22, 2018. She was 98 years old. Mary Louise was born on October 28, 1920 in Mena, Arkansas to her parents, Fred and Margaret (Schelgen) Hairgrove. She graduated from St. Mary's High School in Ponca City in 1938. Mary Louise enjoyed reading, playing games, and watching sports. She enjoyed watching the birds at her bird feeders and enjoyed taking walks outdoors. She was a great strength to her family and friends and a faithful member of St. Mary's Catholic Church. She will be missed by all. She was preceded in death by her parents, son, Floyd Brown, daughter, Mary Beth Allen , two brothers, Robert Hairgrove and Fred Hairgrove, and four sisters, Margaret Hairgrove, Francis Shelton, Helen Hefer, and Clara Soltz. Mary Louise is survived by her son, Robert Brown and wife, Irma of Kingwood, Texas, daughter, Jeannie Kammiller of Ponca City, daughter-in-law, Martha Brown of Peoria, Arizona, grandchildren, Dale Brown and wife, Lori of Ponca City, Becky Luis and husband, Lonnie of Ponca City, Lisa Giager and husband, Danny of Fairview, Oklahoma, Rob Brown and wife, Suzanne of Bozeman, Montana, Heath DePriest of Fulsher, Texas, Chris Brown and wife, Pati of Baton Rouge, Louisiana, Cathy Gill and husband, Brian of Kingwood, Texas, Floyd Brown of Phoenix, Arizona, and Jared Huntley of Redlands, California, as well as 15 great-grandchildren, one great-great-grandchild, and numerous nieces and nephews. A Mass of Christian Burial will be held on Thursday, November 29, 2018 at 10:00 am at St. Mary's Catholic Church with Father Carson Krittenbrink officiating. Burial will follow at St. Mary's Cemetery. A rosary service will be held on Wednesday, November 28, 2018 at 6:00 pm at the Trout Funeral Home Chapel. Friends and family are welcome to pay their respects at the funeral home on Tuesday, November 27, 2018 from 5:00 pm to 8:00 pm. Casketbearers will be: Dale Brown, Heath DePriest, Lonnie Luis, Danny Giager, Austin Luis, Cade Sloan, and Floyd Ray Brown. Honorary casketbearers will be: Bing Shelton, Ronnie Shelton, and Tim Shelton. Memorial donations may be made in Mary's honor to St. Mary's Catholic Church, 707 E. Ponca Street, Ponca City, OK 74601. To send flowers or a remembrance gift to the family of Mary Louise Brown, please visit our Tribute Store. "Email Address" would like to share the life celebration of Mary Louise Brown. Click on the "link" to go to share a favorite memory or leave a condolence message for the family.